It’s difficult to tell who is really friends off-screen with a franchise like Housewives (or what friendship even means to them), until the episodes air and the castmates get to displaying receipts in the form of text messages, including group texts, which are usually good indications of who maintains friendships off the show. Cynthia and Nene seem to be actual friends, but Cynthia is also good friends with Kenya Moore, a former castmate who did not appear on this season of RHOA but did show up in the finale (pregnant) last night to support Cynthia at a party celebrating Cynthia’s wine cooler. Nene is big on friends not cavorting with her nemeses, so obviously she didn’t take Kenya’s appearance well. You could see it on Nene’s face. Although Cynthia claimed she didn’t know Kenya was coming to the event, Bravo caught and played a hot-mic moment that seemed to suggest Cynthia knew Kenya would show up. (It was a phone call between Cynthia and Kandi that proved collusion.) Seems like a technicality, but also a lie: Cynthia said she invited Kenya but wasn’t sure she’d show up, meaning ah-ha-ah, technically she didn’t know Kenya would be there. But Kandi also admitted in a confessional that Cynthia told her not to tell anyone Kenya was coming. Bravo did something I hadn’t seen them do before, which was air a scene after wrapping up a few of the cast members’ storylines with “Where are they now” updates. 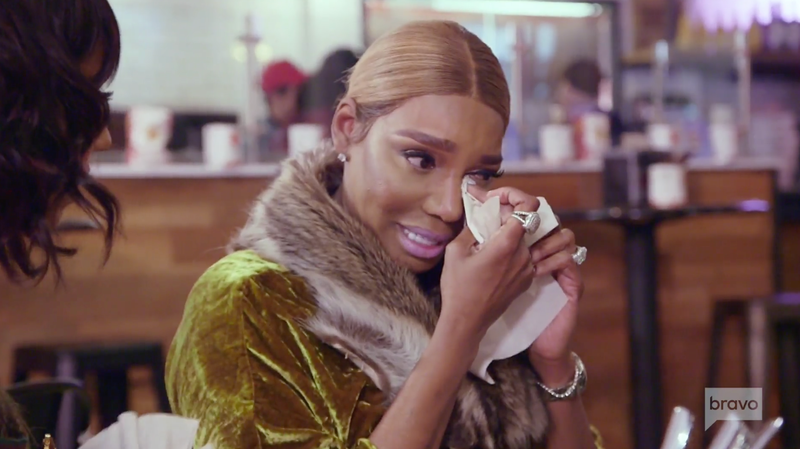 The show went to commercial break and returned with an additional lunch scene between Cynthia, Nene, Kandi, and new castmember Tanya Sam—this scene played out like an epilogue to the entire season. Nene was visibly upset over lunch and said her gripe was that Cynthia gave her no heads up about Kenya and showed more attention and gratitude to Kenya at the party than to Nene, who is always talking about who’s a “real friend” to her and who needs her friends to be good to her at the moment because of what she’s going through with her husband Gregg’s cancer battle. To Nene, Cynthia’s actions showed where her alliance lies and, because of the animosity, Cynthia is snare-trapped between two close buds. It’s unclear and maybe even unrealistic what Nene wants from the situation: for Cynthia not to be friends with Kenya? For Cynthia to place her above Kenya emotionally and demonstratively? At the least, it is important for your friend not to lie about your enemy. “You think I have nothing better to do than to sit here and piss you off,” Cynthia says, in a rare moment where viewers see her defending herself against Nene.